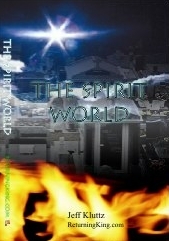 We’re giving away The Spirit World book to ReturningKing.com readers! The Spirit World is a study of the afterlife in scripture. Far from simply referring to “Heaven and Hell,” the scripture reveals an assortment of containers which temporarily sort the souls of men and angels prior to the eternal state. Places such as Sheol, Abaddon, and the Abyss are commonly used interchangeably by well-intended teachers of scripture. Yet, scripture itself does not use these terms interchangeably at all; for each has a unique characteristic among the others. The Spirit World provides a thorough examination of these terms and others, while time lining the course of human and angelic history from creation to the eternal state. Additionally, The Spirit World will examine the nature of the judgments of the righteous and the wicked, as these actions are the trigger events which relegate men from the temporary to the eternal abodes. Abaddon is also a Hebrew term, thus is constrained to the Old Testament, except for one occasion when the Hebrew term is referenced in its original language in the New Testament. Abaddon appears seven times in the Bible. Since it is used so sparingly, this chapter will examine each use of the term. Abaddon is translated “destruction” throughout the NIV and KJV, except for the Revelation passage, where Abaddon is rendered in its native Hebrew, as a proper name. 6 “The LORD brings death and makes alive; he brings down to the grave (Sheol) and raises up.